1. Retro Vintage Designed: Made of premium quality opal glass with the classic shape of vintage Globe A60 and cool white 6000K colour, creative a retro and cozy warm ambience for home or commercial occasions. 2.Energy Saving: Save up to 80% energy by only 8W led bulb, replaces the standard 80W incandescent light bulb for Chandelier and various kind of light fixture. 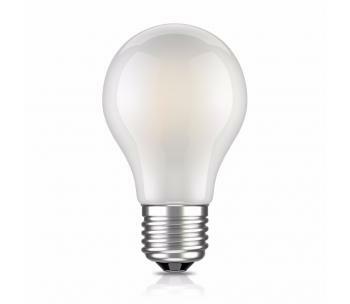 Reducing the cost of frequent bulb replacements. 3. Easy Installation: Designed with classic E27 edison screw cap, install it easily without any more help. 4. Eco-Friendly: No mercury and other harmful substances, not only bring enough brightness but also get a safety assurance for your family. 5. Ideal Choice for Decoration: Classic style and warm glow brightness, opal glas and metal base, creating a romantic and cozy environment,perfect light bulbs for decorative light fixture, and ornamental Fixtures which have the cap base with E27, and can also be used elsewhere such as residential homes or commercial locations. Modern elements and classic designed will perfect compatible with your for decorative wedding lights, decorative light strands, commercial light strings, ornamental fixture, pendant fixtures or various kinds of light fittings for living room, dining room, bedroom ect.